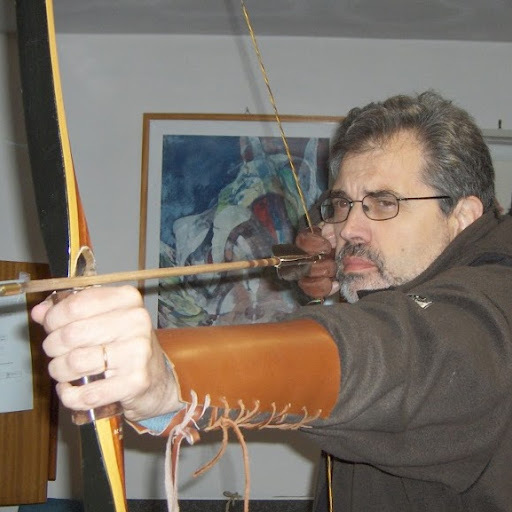 An authentic duel of titans, one of the best post of the year. Please, I want to see the end. I'm curious as to when everyone here thinks Peak Shale will kick in. I read somewhere that the production of new wells drilled in the third quarter of 1918 was less than for the same period in 2017. That sounds like most of the "sweet spots" have already been drilled and they will have to be drilling even more desperately in less productive areas just to maintain production. 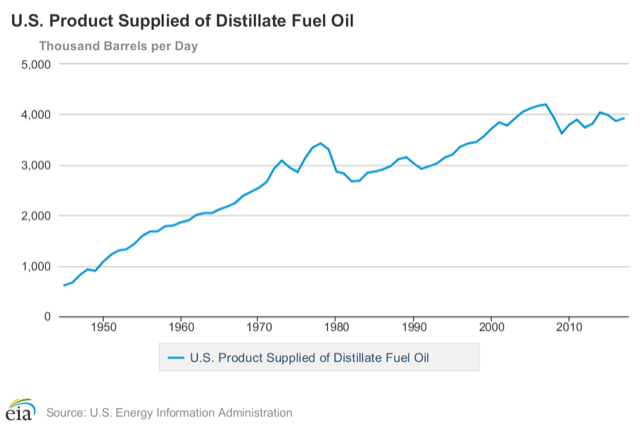 It seems that when we hit Peak Shale, we will also have hit Peak All Liquids. Whatever our short term concerns with diesel may be, I think the real blow to the economy will come within a year or two of Peak All Liquids. If I recall aright, it was Art Berman, some months ago that gave two to three years before Peak Shale. Does this sound about right to everyone here, and also does it seem like my idea of Peak Shale and Peak All Liquids happening about the same time seem likely. The zillion dollar question, Antonietta. And, as a descendant (I imagine) of Queen Marie Antoinette, once the peak arrives, you could say "let them eat palm oil"
Thanks for that Ugo, looking for the sequel ! In the case of petroleum coke, or petcoke, as it is commonly called, this is a byproduct of processing asphalt or other very heavy residual oils into as much middle and/or light distillate as possible. The asphalt is heated to a very high temperature in a coking unit to break down heavier hydrocarbons (pyrolysis), and vapors driven off by this process can be cracked, hydrotreated, etc. 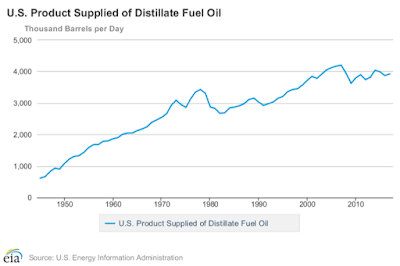 into liquid fuels. 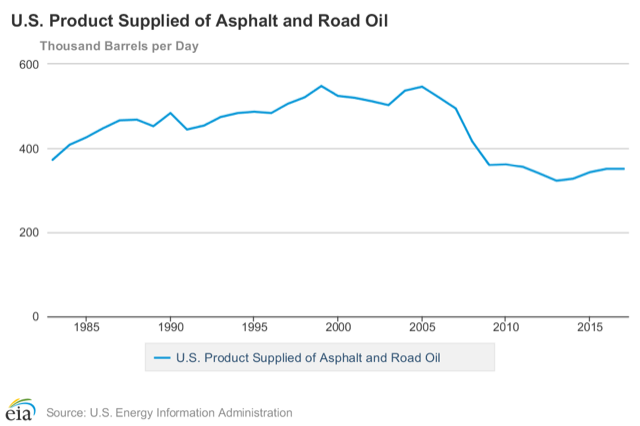 When this first became common practice in the US several years ago, the price of asphalt increased quite a bit as so much of it was diverted into making fuels. 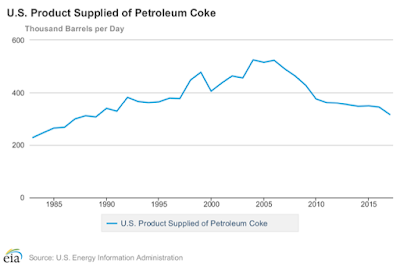 I am not a petroleum engineer, but my guess is that if less petcoke is being produced, the process has improved over the years to leave less coke when complete. 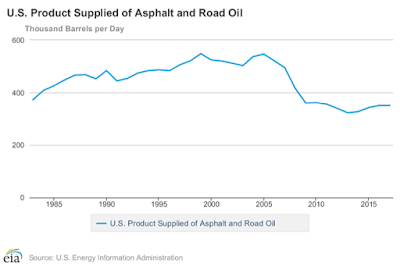 As I understand it, refining extra-heavy oils, such as Canadian bitumen and Orinico, is not practical without coking, unless the objective is to produce a large proportion of asphalt. (Note that some buyers in China are taking shipments of Canadian bitumen for this purpose.) The US has been buying large amounts of Canadian crude for the past several years, and I actually found the reduction in produced petcoke surprising. 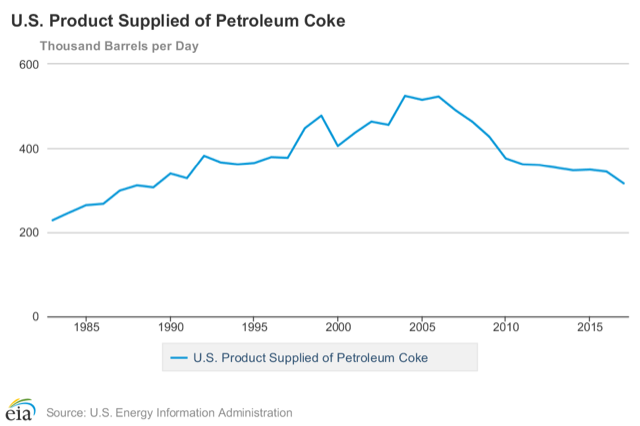 The general trend in the US is toward producing more petcoke. But the amount of oil imported from Canada, especially the increase compared to several years ago, is primarily extra-heavy. And the drop in imports from Venezuela is less than the increase from Canada. I have a bit of an issue with Gails statement that 2008 drop was due to less heating oil demand. 2005 to 2008 I lived in the middle of the Willamette valley OR. I had a restaurant and was working closely with area farming. During that period diesel fuel was on a steady climb in price. One of my suppliers, Sysco Foods first sent out a notice that they were going to absorb cost as it was just a blip. Six months later they said they were going to increase price on certain items that were highly effected by the fuel increase. Later they notified everyone that there would be a fuel charge on all orders, then they sent out a notice warning restaurant owners to increase their prices as these increases were not going away and some restaurants were going broke trying to absorb the cost and not pass it on to customers. During all this what they call offroad diesel or farm diesel, the red stuff higher in sulphur, was going up and up and becoming unavailable in some areas. BIG problem. Also nearly all farm inputs were increasing dramatically, Ammonia went from $100 per ton to almost $1000. Around here there were as many or more diesel pickups as gas, after a couple years you could not give a diesel truck away and compact cars lined all the parking areas on the farms and job sites. I don't doubt that a lot of households moved away from heating oil during this period but that is only Incidental. I do remember reading some analysis pointing to a booming EU economy and rising diesel demand there and around the world as at least part of the puzzle. 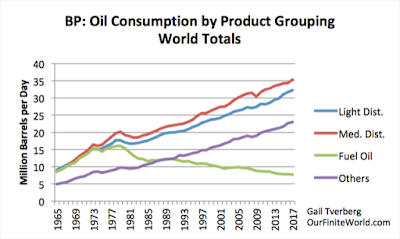 With that in mind it would seem that due to the "Global economy contraction" and EU down turn, it would seem that peak diesel has been given a bit of a temporary reprieve, which is how peak oil seems to be playing out in general. There appears to be an error with Turiel's data. I compute 2017  average (not 12 month trailing average) gas/diesel oil refinery output from the JODI - Secondary (all data) set as 26.275 [26.308] Mb/d. Just rounding errors. Diesel is needed to bring diesel to us, diesel fuel is needed by the Oil Industry. 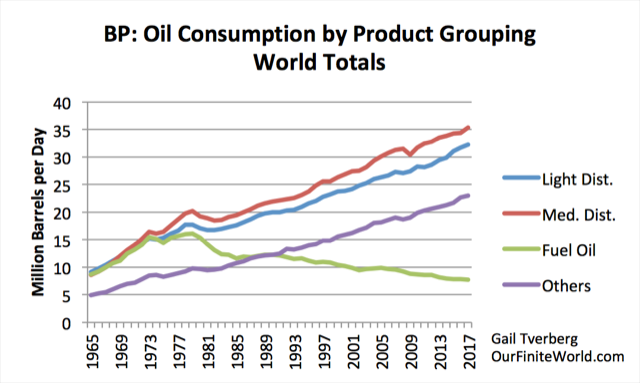 Oil industry gets first pick , and the global economy gets what is left over. Any further fall in EROI for diesel compounds on the global economy, on mining, and oil EROI to the end point of exergy release. Diesel flat-lining is a sign of less net available diesel, and real global economic decline. Demand fall and changes in production allocation, and real financial and economic stress are all happening at the same time, and the workers real wage declines and falls in consumption. Its all linked and now maybe too hard to disentangle cause and effect as everything starts to change and adapt at the same time. 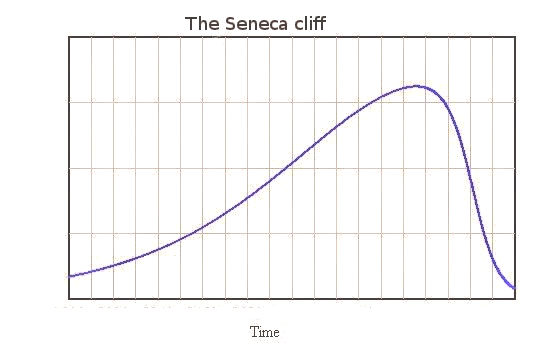 Maybe flat-lining diesel is a sign of this systems real Seneca Collapse stage in progress. Others have looked at Turiel's JODI data. It's a nothingburger and the last month of data will always be a downleg. How anyone can take the JODI data set seriously when Iran is missing 3 months and there is no output from Venezuela in 2017 is beyond me. Contradictory data sets is a fact of life in reporting or analyzing trends in the energy realm. The reasons for these discrepancies is not always clear. It can be as simple as using different units or in the case of renewable sources using nameplate capacity vs real world delivered capacity. There is also the Mark Twain issue of "Figures can lie and liars can figure." Another issue not noted(?) is whether the anticipated switch of ocean carriers using bunker fuel to using #2 diesel will draw from the #2 diesel pool used by trucking , Ag and heavy industry thereby inducing scarcity and possible price jumps. It would seem to me that increasing middle distillate prices say for heating oil will cause those customers to switch if they can to a cheaper heating source and thereby free up that fuel which could flow to #2 diesel users. For example if diesel became twice as expensive as gasoline some sectors might be able to use gasoline to run their trucks or tractors but that would only happen if the gas/diesel differential stayed wide and prolonged. Big Trucks or tractors in my field are a rarity and expecting engine makers to change back to gasoline power would probably not happen rapidly enough to make a difference. 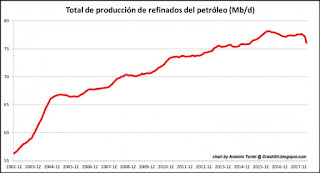 Conventional crude is the ideal feedstock for diesel production and that is declining and if that continues diesel production will follow unavoidably. I eagerly awaid Ugo and Gail and Antonio continuing this thread. 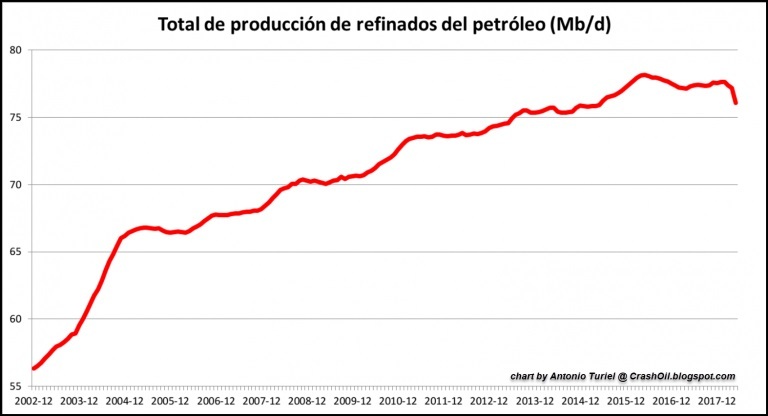 Is diesel production really declining or is it a statistical aberration? Terrific post UGO! As a set of closely related curves with constant growth rates they clearly define a family of current natural growth constants for the world economy. Why that is, and why it has not been discussed much, are a considerable mystery, of course. It's strange that the global economy appears to work so very smoothly, even while everyone's perception is of things fluctuating quite unpredictably all the time. I think that contradiction is itself the clue to the real answer. What the smooth global data would seem to display is the economy working as it is supposed to, actively and creatively allocating needed resources to where they will be most productive. For energy, it means the economic markets are finding and developing alternate energy resources, as needed, to satisfy the continually growing demand for global energy supplies. So I think as long as maximizing the global rate of economic growth is the institutional design of the economy, and common driving purpose of both the financial and political worlds, growing competitive energy resources and will continue to be supplied. At present, we seem to have the technology and creativity to discover new sources as needed, so I expect it will continue for now at least, to fill in whatever gaps develop. Of course, that's terrible for climate mitigation efforts; having a purpose in direct conflict with the current economic organization and motivation for globally maximizing the rate of growth. So perhaps our interests in recognizing approaching peaks of overdevelopment and the hazards that come with them may only need to creatively follow the threads to focus on the right subjects and scale for exposing the questions people need to face.